Another person was killed at Sukanjuli Firing Range along Indo-Bhutan border under Darangamela police outpost in Baksa district of Assam on Monday. The deceased has been identified as one Albinush Tudu, aged around 23 years and son of Deniel Tudu of Hartola village along Indo-Bhutan border in Baksa. 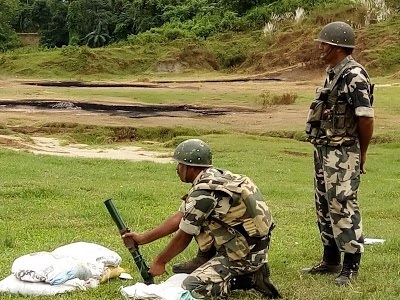 According to locals, training of firing and blasts of explosive by Indian Army personnel are going on at Sukanjuli firing range which is the only most firing range in the region. On Monday evening, Albinush went to Sukanjuli firing rang with his friends to collect splinters and parts of explosive. While Albinush was waiting for splinters with his friends hiding inside a bunker on Sukanjuli hill, splinters of explosive hit suddenly hit on the head of Albinush and he fell down on the ground unconscious. Albinush was shifted to Kumarikata State Dispensary by his friends, but doctor declared him brought dead. At night a team from Darrangamela police outpost took the body of Alibinush into its possession. The police later arranged to send the body for postmortem on Tuesday morning. Notably, curious locals, including small children frequent the firing range in search of splinters and empty shells and cartridges. These people living in abject poverty sell these items for some petty amount. Concerned circles have been demanding a boundary wall in the firing range, but to no avail. Accidents like this have been taking place from time to time in the firing range.